Promises are like castles made of sand...Kayla believed Zach was the man to repair her heart and her family. Zach believed Kayla was the woman to repair his soul. But Zach’s secrets are too big, his guilt too heavy, for him to keep his promises. He needs to get out now before he causes Kayla more heartache than the young widow has already endured. 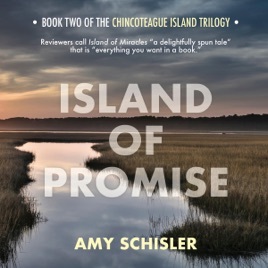 There’s nothing like a crisis to bring two people together, and suddenly, the idyllic island off the Mid-Atlantic coast has those in spades. A serial killer has found his way into paradise, bringing Zach’s former life close to home, and Kayla is facing a health scare that is every woman’s worse nightmare. Will the tragedies they face pull them apart or bring them closer to fulfilling their promises to each other?